The Icelandair Group enjoyed another strong year in 2015. Double-digit capacity and traffic growth, load factor gains and low fuel prices helped to counter weak unit revenue, taking net profit up by two thirds compared with 2014. Its double-digit EBIT margin ranks it among Europe's more profitable legacy airlines. The main engine of Icelandair's growth continues to be its sixth freedom connecting traffic between Europe and North America. Most world map projections make its Reykjavik hub look like a major detour as a stopover, but a casual look at a globe shows it is not far off the great circle routes between many destinations in the two continents. This connecting traffic strategy is supported by strong inbound tourist demand to Iceland. In order to make one-stop routes attractive against direct flights, Icelandair must be price competitive. It has continued to grow its profits in spite of LCCs' taking an increasing share of seats to/from Iceland in recent years. However, unit revenue is likely to remain under strong downward pressure, particularly given a number of competitor route launches in 2016 and Icelandair's plans to accelerate capacity growth. In 2015 Icelandair Group reported a 67% increase in net profit to USD111 million. The operating result, or EBIT, grew by 71% to USD135 million. The Group's revenue increased by 2% to USD1,140 million, and its EBIT margin gained 4.8ppts to reach 11.9% in 2015. Much of the improved profitability was due to lower fuel prices. Icelandair's fuel cost per ASK fell by 26% in 2015, according to CAPA calculations. This double-digit EBIT margin puts Icelandair in rare company among European legacy airlines, although it is still behind the more profitable of the LCCs. Ryanair achieved an operating margin of 22.4% and Wizz Air made 16.5% in calendar 2015, while easyJet's margin was 14.7% for the year to Sep-2015. The majority of legacy airlines have yet to report results for 2015, but Icelandair is likely to be one of only a very small number with a double-digit margin. For Icelandair, 2015 was the seventh successive year of positive EBIT and the sixth successive year of positive net profit. In addition, it continued to maintain a year end net cash balance, albeit one that was slightly lower at the end of 2015 (USD149 million) than at the end of 2014 (USD154 million). Its gross liquidity of USD214 million at the end of 2015 was equivalent to 69 days of revenue. Icelandair increased ASKs on its international network by 15% in 2015 following 16% growth in 2014, helping it to maintain an average growth rate of 16% pa since 2009. Capacity growth in 2015 reflected the launch of routes to Birmingham and Portland and increased frequencies to Toronto, Washington Dulles, New York Newark, Boston, Amsterdam, Copenhagen, Zurich, Billund, Edmonton, Seattle, Vancouver, Brussels, Hamburg, Helsinki, London Gatwick, Munich, Paris CDG and Glasgow. Passenger numbers rose 18% to 2.6 million and load factor gained 2.8ppts to 83.1% in 2015. Its international load factor has increased by almost 4ppts since 2013, and by more than 8ppts since 2009. The group's regional airline Air Iceland operates highly seasonal routes (summer-focused) in Iceland and Greenland and carried 296,000 passengers in 2015, up 1% year on year. Total scheduled ASK growth was 14%. The international network remains by far the main driver of the business. Icelandair's growth of 18% in international passenger numbers in 2015 was not evenly distributed by market segment. The number of passengers flying between Europe and North America and connecting through Reykjavik (the 'via' market) increased at the faster rate of 21%, while traffic originating in Iceland (the 'from ' market) was up at the lower rate of 11%. Traffic originating outside Iceland and travelling to the country (the 'to' market) grew by 18%, in line with the total. This was the strongest growth in the 'to' market since 2012 and was supported by the strength of inbound tourism. The connecting passenger segment has grown faster than the other two segments for several years, providing a strategic cornerstone to Icelandair's rapid growth. From 2009 to 2015, total traffic increased 2.3 times, while the via segment grew 4.0 times and raised its share of total international passengers from 28% to 49%. In 2015, North America overtook Europe (excluding Iceland) as Icelandair's main point of sale region. North America accounted for 37% of revenue in 2015, compared with 32% in 2014, while Europe generated 32% of revenue versus 35% in 2014. The share of revenue generated in Iceland fell from 25% in 2014 to 24% in 2015. Iceland is often included in the Nordic region. However, the split of Icelandair's market segments and revenues put it in a different market than those of the Nordic region's principal airlines, SAS, Norwegian Air Shuttle and Finnair. 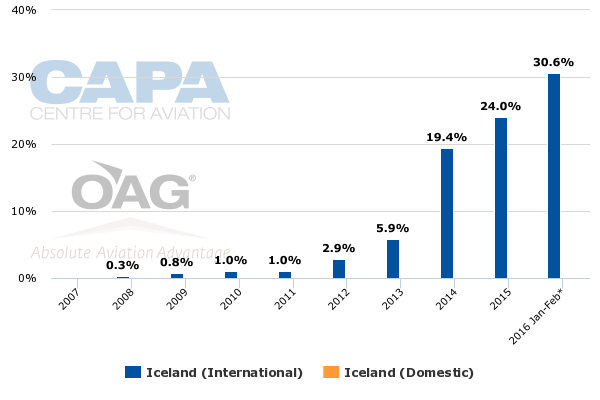 Icelandair's total revenue per ASK fell by 10% in 2015, according to CAPA calculations. Unit revenue was weakened by currency movements, but this decline in RASK also reflects the inherently competitive nature of a high-growth strategy based on attracting one-stop transfer traffic away from direct routes offered by competitors. The group improved its EBIT margin in 2015 thanks to a more rapid fall in total cost per ASK, down 15%. This unit cost performance was helped by lower fuel prices, but ex fuel cost per ASK was down 11%, also a bigger fall than unit revenue. Icelandair's successful and profitable growth is continuing even as LCC competition increases. The share of seats operated by LCCs to/from Iceland grew to 24% in 2015, up from 19% in 2014 and just 6% in 2013. In 2016 so far (Jan-Feb), LCCs have 31% of seats. Icelandair has experienced a fall in market share in recent years as LCCs have gained share. In the first week of Apr-2012 the Icelandair Group had 80% of seats to/from Iceland, whereas its share in the first week of Apr-2016 will be 59%. Over the same period, Icelandic LCC WOW Air will take its share from zero to almost 18%, and easyJet's share will grow from 4% to 8% (according to schedules data from OAG). However, market share does not tell the whole story. Icelandair may have a smaller share than previously, but the impact of LCC growth has been to grow the whole market and Icelandair has also grown (albeit at a slower rate than the market overall). 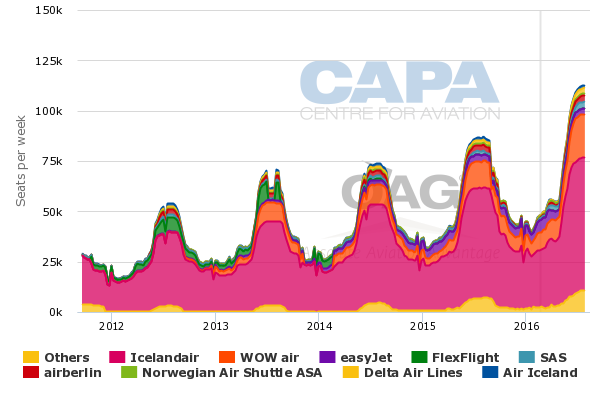 Moreover, the number of connection opportunities offered by Icelandair has increased significantly since WOW air's entry into the market. This is more important than its raw share of seats, given the importance of transfer traffic to its growth. In summer 2013, Icelandair had 19 destinations in Europe and 10 destinations in North America, giving 190 city pairs linked through Reykjavik. In summer 2016, it will have 27 destinations in Europe and 15 in North America, giving 405 city pairs linked through Reykjavik. The number of destinations is up by around 50%, but the number of city pairs has more than doubled over three years. This compares with WOW's 19 destinations in Europe and six in North America, giving 114 city pairs. No other airline offers trans-Atlantic connections through Iceland and only Icelandair operates widebody aircraft. Reykjavik continues to be a dynamic market and competitors continue to expand this year. WOW Air plans to launch services from Reykjavik to Frankfurt, Toronto, Nice, San Francisco and Los Angeles in summer 2016. The Frankfurt route had been a monopoly for Icelandair until Lufthansa launched a three times weekly seasonal summer service in Apr-2015. Icelandair will increase its weekly frequency this summer to 10 times in response to WOW's six times weekly service to be launched in Jun-2016. Toronto is currently an Icelandair monopoly route, pending WOW's May-2016 launch. WOW will operate four weekly flights, compared with Icelandair's planned twice daily service. Nice, San Francisco and Los Angeles will be WOW air monopolies, according to OAG. As a result, they will have no direct competitive impact on Icelandair. Airbaltic will launch Reykjavik-Riga in May-2016; Icelandair does not operate this route, but this will have the effect of growing the market and potentially adding feed to Icelandair's North American routes. The same applies to Germania's planned launch from Reykjavik to Bremen in Jun-2016 and Wizz Air's new Budapest service in Mar-2016. Delta is to launch a daily Minneapolis St Paul-Reykjavik service in summer 2016, in competition with Icelandair's daily service. The two compete on the New York JFK route, where Icelandair has a twice daily service versus Delta's eight times weekly. Iberia Express will launch a twice weekly Madrid-Reykjavik service in Jun-2016, when Icelandair plans to increase its operation from once to twice weekly. Icelandair will also continue to expand rapidly. Indeed, it has increased its planned 2016 ASK growth on international routes from the 18% announced in Sep-2015 to 24%. This figure will be made up of new destinations (4.5%), increased capacity on European routes (9.3%), and increased North American capacity (10.2%). For 2016, Icelandair has added two Boeing 767-300s and one 757 to its previous fleet of 24 757s. According to data from OAG, Icelandair is to launch services to Chicago and Aberdeen in Mar-2016, where it will be the only operator. In Mar-2016, it will also add Paris Orly to its Paris CDG service (to which airport WOW also operates). Orly-Reykjavik is already operated by Air France-KLM LCC subsidiary Transavia. In addition, Icelandair will launch Montreal in May-2016, in competition with a planned new WOW Air service this summer. Helped by lower fuel prices, Icelandair expects further profit improvement in 2016. It targets EBITDA in the range of USD245 million to USD250 million, compared with USD219 million in 2015 (an increase of 12% to 14%, after a 42% increase in 2015). Icelandair has seen off LCC competition before. WOW Air withdrew from its peak summer-only Zurich service in 2014 after Icelandair doubled its capacity on the route, and Icelandair has been the sole operator since then. Competitor airlines help to increase customer awareness of the Iceland market and to increase the number of connecting traffic opportunities through Reykjavik. As noted above, WOW Air is the only other operator offering one stop trans-Atlantic services via Reykjavik, but Icelandair has a much wider network on both sides. Nevertheless, competition from LCCs on point to point routes between Iceland and Europe and between Iceland and North America cannot be ignored as it adds to downward pressure on unit revenue. Against this background, Icelandair's successful unit cost reduction in 2015, even after taking account of lower fuel prices, was crucial. Cost management will also remain crucial in 2016, when unit revenue pressure is unlikely to relent.